Day 8: No surprise we did not wake up particularly early for day 8, since we were completely exhausted at the end of day 7. Today was our day to explore Disney California Adventure (DCA). 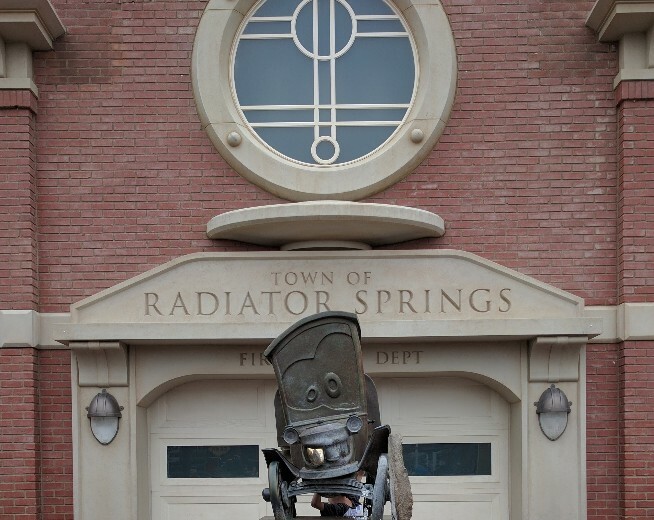 The one must-do on my list was Radiator Springs Racers. This attraction is located way in the back of the park. Standby wait times easily exceed 60 minutes so my first goal of the day was to obtain a Fast Pass for us to ride later without having to wait in those long lines. I have to admit I did not research to the best of my ability on this one. 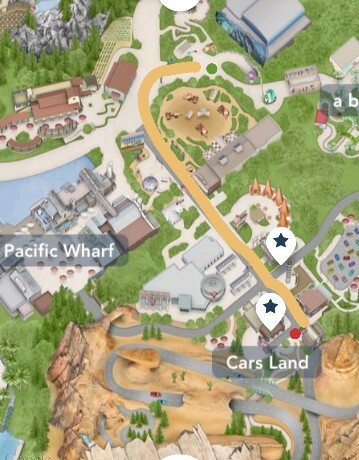 I assumed that the Fast Pass kiosk for Radiator Springs Racers was somewhere near the ride. WRONG! The kiosk is near It’s Tough to Be a Bug which is not even in Cars Land. These Fast Passes have the potential to run out quickly on busy days. We had gotten a late start and at this point we were way in the back of the park at the attraction. The standby line was marked as 45 minutes which turned out to be closer to 60 minutes. Side note: Disney World wait sign times seem to be more accurate than the Disneyland ones so Disney World gets the win on that. I figured 45 minutes (or even 60 minutes) was far better than 95 minutes or more later in the day if the Fast Passes were already out. We decided to wait. It was worth it! You start out taking a leisurely drive through town, but then at the end you race another car Test Track style. It was so good! 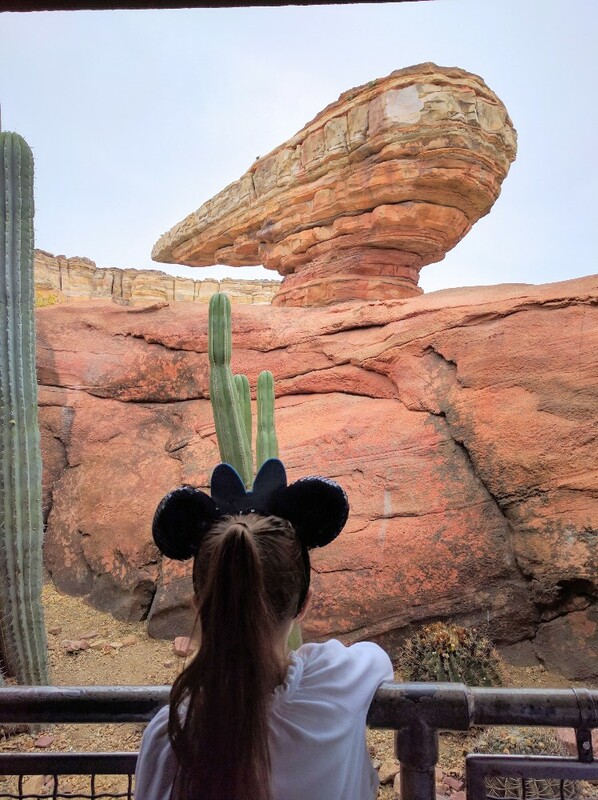 From here I hustled all the way back to the Fast Pass kiosk because we all agreed that we had to ride Radiator Springs Racers again if at all possible. I was able to snag the passes, but they were for several hours later in the day. Next up was Luigi’s Rollicking Roadsters and “meeting” Lightning McQueen. Believe it or not it was already time for lunch. 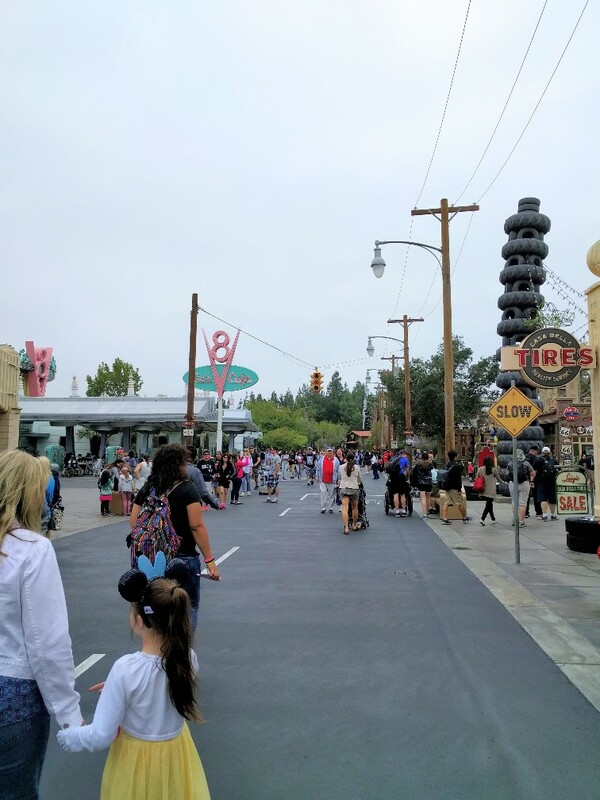 Since we were in Cars Land we had two good choices: Cozy Cone Motel or Flo’s V8 Cafe. My crew voted for Flo’s. Elizabeth and I shared the spit-fired rotisserie quarter chicken. I did not realize that it was only available as dark meat, but it was so good we really didn’t mind. 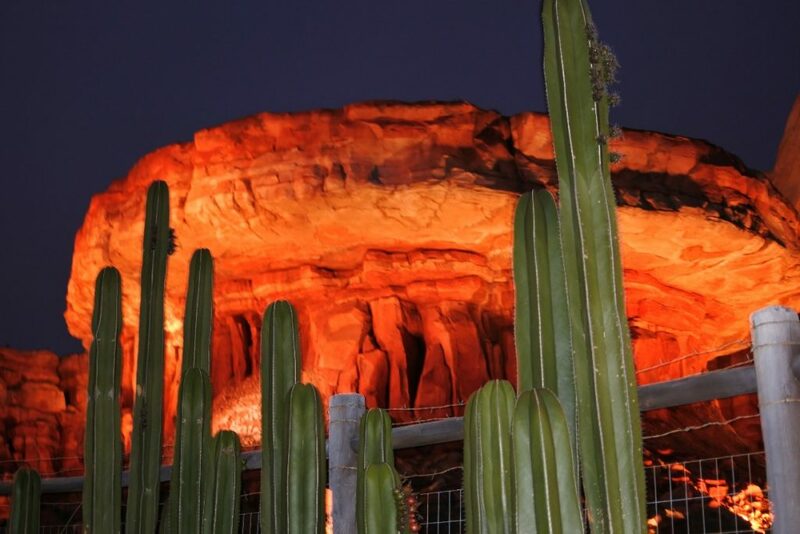 We finished our tour of Cars Land with Mater’s Junkyard Jamboree before moving on to the Little Mermaid – Ariel’s Undersea Adventure (which is just like Under the Sea – Journey of the Little Mermaid at Magic Kingdom). 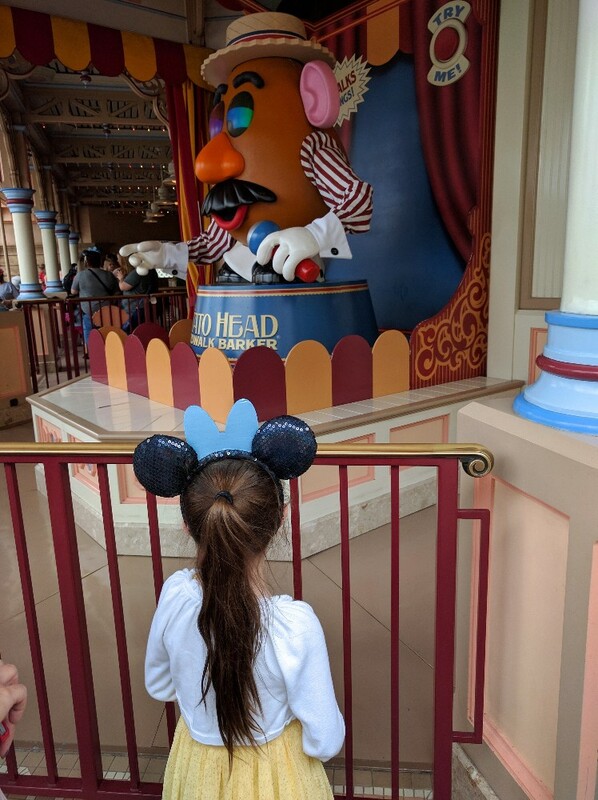 Wait times were reasonable for Toy Story Midway Mania (40 minutes vs the usual 90 minutes plus at Hollywood Studios) so we made our way over there. There is not a Fast Pass for this attraction at Disney California Adventure whereas it is a hard to get Fast Pass+ at Hollywood Studios. We wanted to do a little bit of shopping in Downtown Disney at World of Disney, but got sidetracked by a 40-minute wait sign for Soarin’ Over California. Soarin’ never disappoints, but unfortunately the wait was closer to 70 minutes. This cut into our shopping time, but we made the best of it before we went to our World of Color dining package reservation at Carthay Circle. This was a true fine dining experience. We lingered over a glass of wine (only milk for Elizabeth, of course) but may have lingered a bit too long. Dinner was nearly a 2-hour affair and almost made us miss our hard earned Radiator Springs Racers (RSR) Fast Pass window. We luckily made it in time and enjoyed the ride at night just as much as earlier in the day. 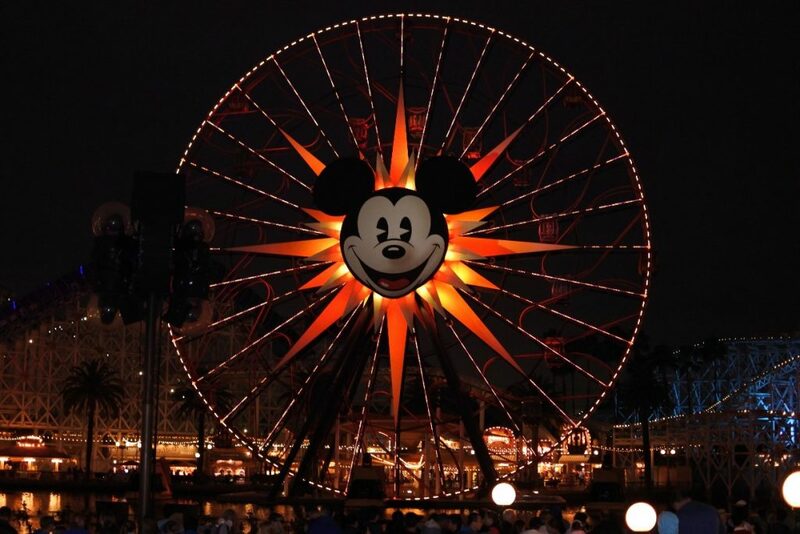 Now to make our way to the special viewing section for our World of Color dining package. 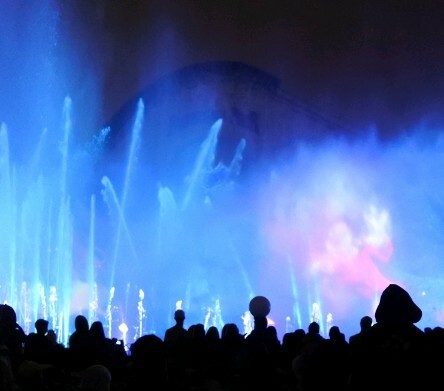 World of Color uses water curtains and projectors much like Fantasmic! does. It was a spectacular nighttime show. 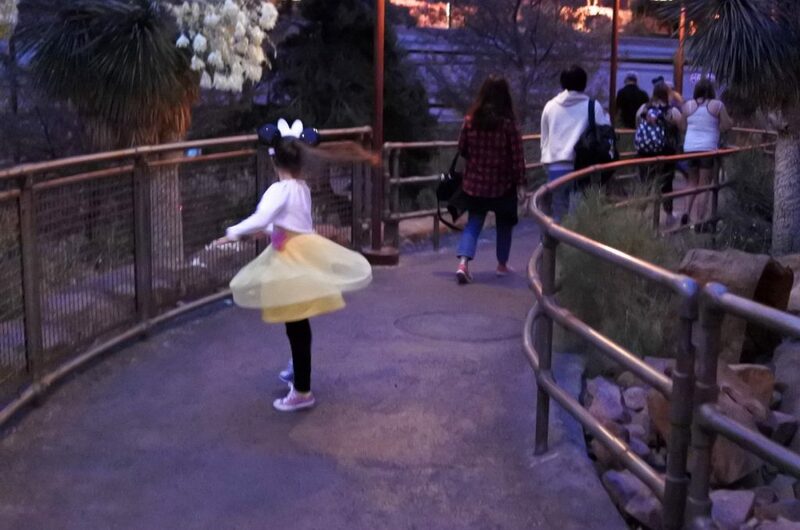 When World of Color ended it was already park closing time so we sadly made our way out. 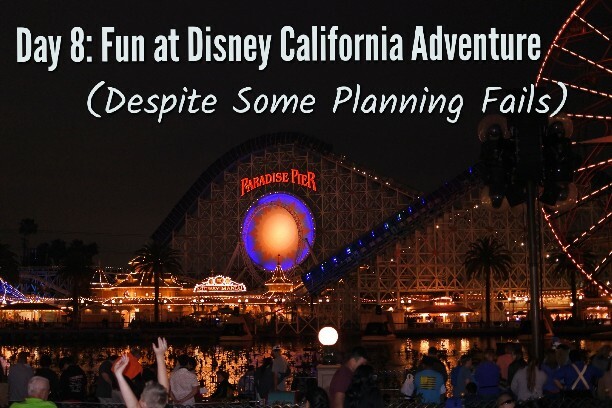 Although it had been a day of fun I certainly could have done better in my planning for DCA. 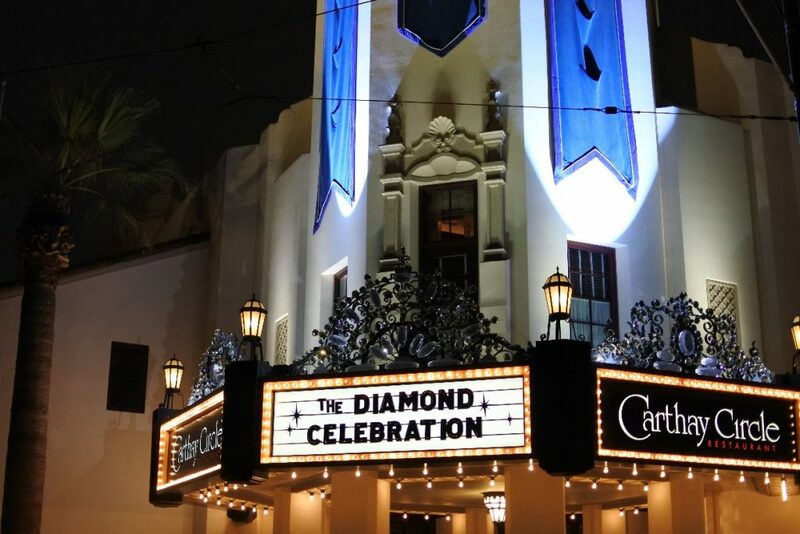 Two lessons I definitely learned: Research where Fast Pass kiosks are located before going into a park and don’t dine at Carthay Circle if riding attractions is your jam. The meal is amazing, but the time commitment is substantial. We had good luck with the single-rider line for Radiator Springs. Even though we were not guaranteed to ride together, we usually did. There are 3 seats across, so it leaves on open seat in front and back with most groups. We loved that ride because it is unique to Disneyland. We also found the location of fast passes frustrating, as well as the fact that not all rides have them available. I’m glad someone shares my paper FastPass pain. That is helpful advice about using the single rider line! We will have to try that out in March. Thank you!